Refunding a certificate is appropriate if you no longer wish to use it or if you want to change the domain for the certificate. We can only process refunds within 30 days of the purchase date. If you're outside the 30 days, we can still cancel and remove - but not return any funds. If the certificate has not been issued yet, or if you have a Comodo SSL, simply file a refund and we can process (within 30 days of purchase). Click on the link here. Enter the required information, and click Continue. If the information was correct it will take you to the next screen where you can click on a button to Request Access. Note: If you get a red error message at the top, stating Cannot validate the information you submitted. then please dry a different email address, whatever you may have on file, or try the domain with, and without "www." in front of it. You should have an email shortly in your inbox with a link to your Userportal. Click the link and it will automatically log you in. You have ~24 hours to click the link. 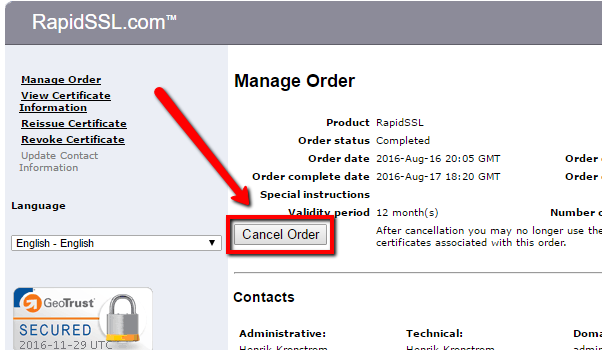 In your userportal, there will be a button at the top to Cancel Order. Note: When filling out the refund form, please clarify you have already canceled the certificate in the comment section!